Chiropractic can treat a number of different health conditions and ailments. Our North Oaks chiropractic clinic is dedicated to treating a number of conditions through chiropractic that you many not think chiropractic care can address. To learn more about any of the conditions we treat just click on a link under our conditions drop down menu. 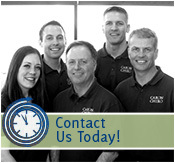 If you would like to schedule an appointment, please contact our office today.